Did Medieval people walk the way we do? Where are the most photos taken? 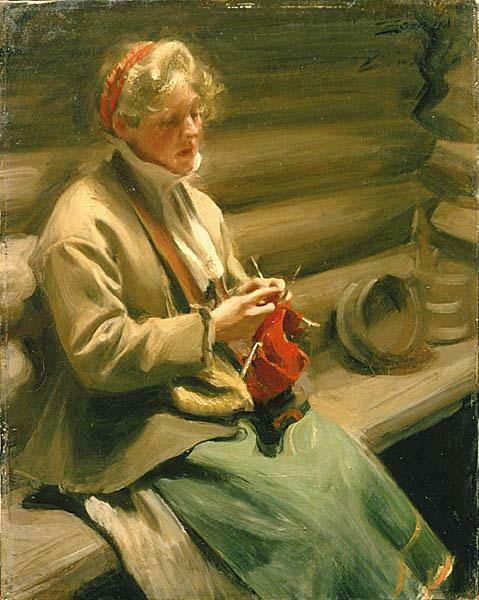 Anders Zorn (1860-1920) was the star pupil of the Swedish Academy, and he left his fellow students spellbound. 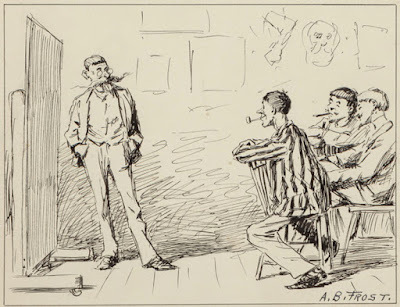 "There were a number of able young men," recalled Bruno Liljefors, a fellow student at the Academy, "and it was a treat to walk about and look at their fresh lay-ins and to admire their pith, color, and truth, as was fashionable then. There were many discussions on the different methods of seeing, their stylish treatments, lucky accidents, etc., endlessly. 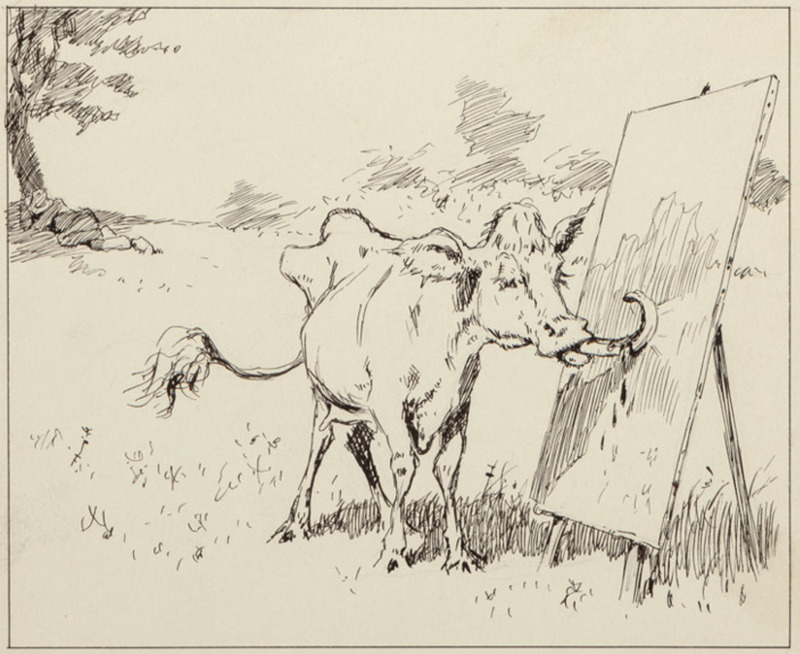 But in front of Zorn's easel, with the whole crowd gathered around, there was absolute silence." "One heard, occasionally, breaking the stunned silence, 'It's the devil.' That was all one heard. It was a powerful indication of how strongly we were all gripped. No one thought or intended criticism. One saw that here was a man with something to say and said it with such a clever and powerful voice there was nothing more to be said." "Should anyone have asked us what it was that gripped us — whether it was the fine color harmony, originality or that it was so up-to-date, we could only have said: 'It was so goddamn good!" "The subject of art lectures was 'truth.' 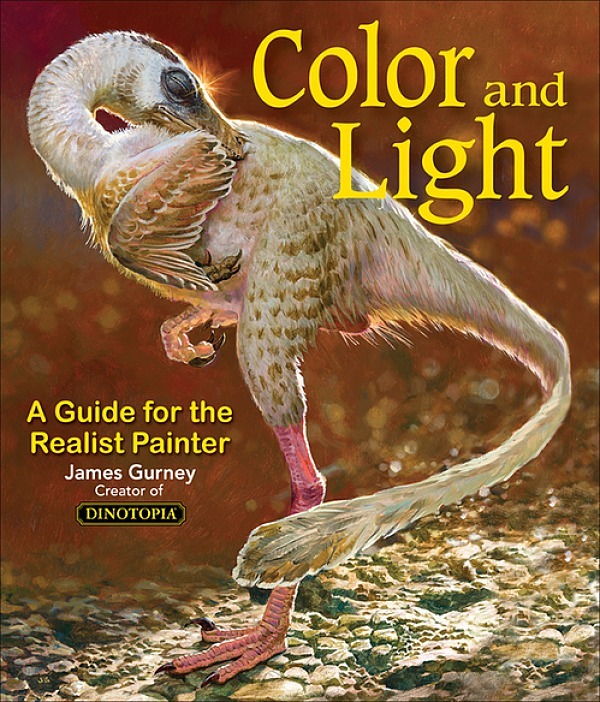 One should paint it 'as it appears,' and painters everywhere began stressing correct values: Colors should be in correct relationship to each other. A single tone accurately judged and painted — color against color — in which the drawing became apparent on its own, was the best way to achieve this result." "But no one dared take the fateful step to do it, to actually embark on this method; they hesitated as if before a precipice, held back, and smeared in details, compromising, until, finally, the whole thing didn't make sense." "But Zorn never hesitated. Like a cat on the rain gutter of a roof, fully confident in its abilities, walking with the same calm up there as down on the ground — with the same self-assurance, Zorn solved the most dizzying problems with this method. He was the first to understand that by this method everything could be painted — from grass and stones, air and water, from women's skin to the life of the soul — only provided the man's hand didn't shake." 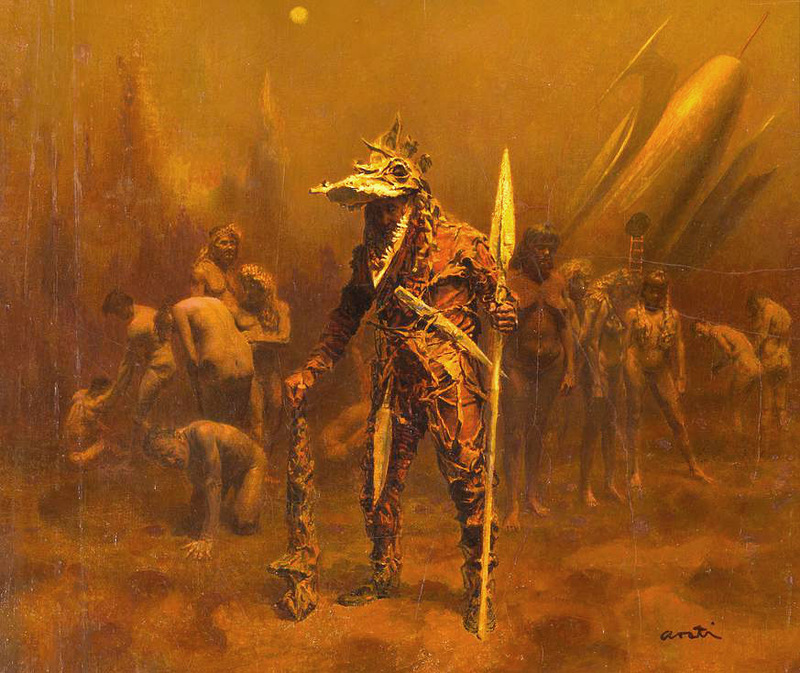 "And Zorn was unafraid. With merciless power he laid color beside color, and in this we have the crux of this so-called magician's quality. Because, by setting the correct values of the large forms, the onlooker himself sees the details, though none are painted, if the values are correct, and they must be correct." 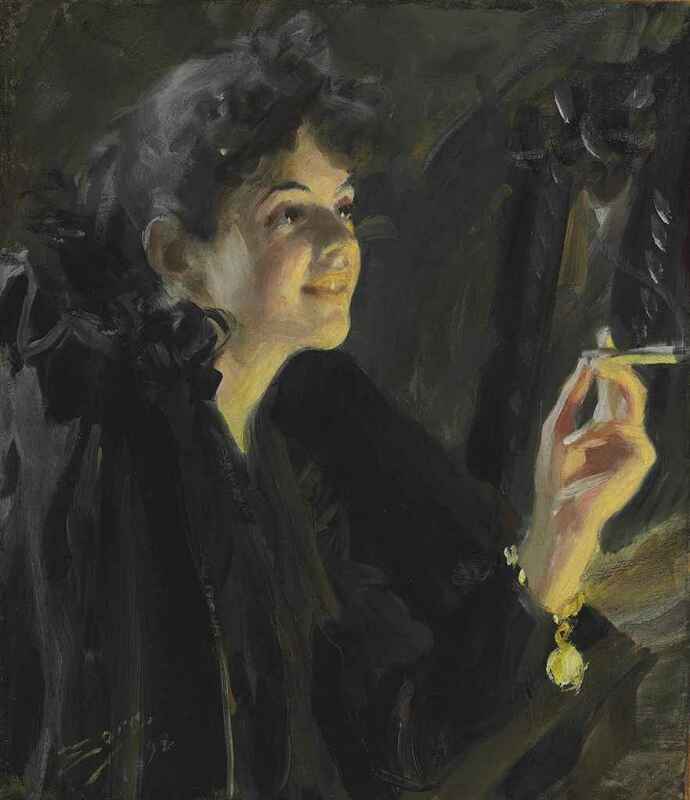 The Petit Palace in Paris is currently hosting an exhibition on Anders Zorn through 17 December 2017. Quotes are from the book Bruno Liljefors: The Peerless Eye by Martha Hill. Arthur Burdett Frost (American, 1851-1928). An artist sets up his canvas in a cow pasture. What could possibly go wrong? 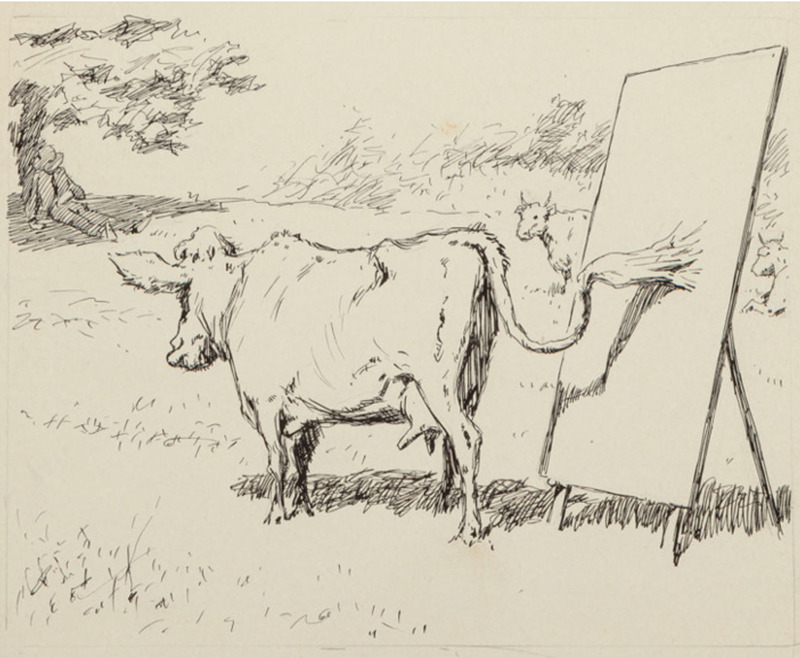 While the artist takes a nap under a tree, the cow sweeps her tail over the canvas and spreads the paint around. Then she gives the canvas a few juicy licks. The resulting painting wins the admiration from his friends—is it a victory for modern art? Frost's sly commentary is just one out of more than 300 lots in the upcoming Heritage Illustration Art auction in Dallas, which includes Gibson, Flagg, Elvgren, Loomis, Nagel, and Von Schmidt. 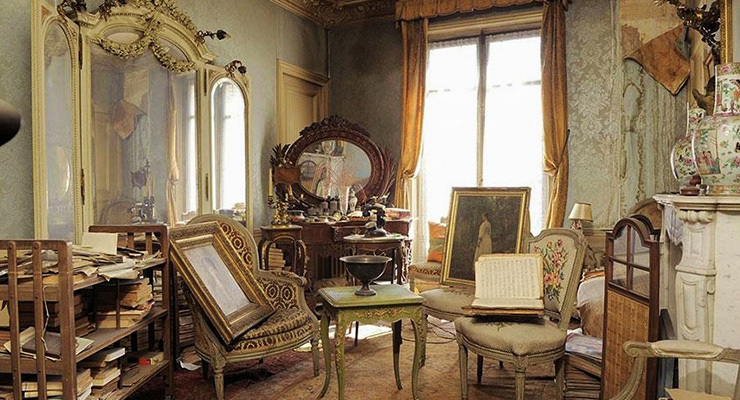 When they unlocked the doors to the Paris apartment, it was like discovering King Tut's tomb. 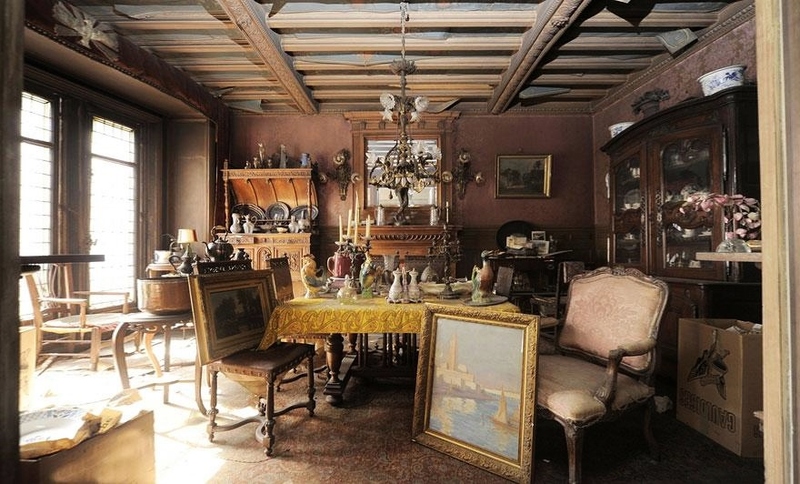 The rooms had been sealed up since World War II when its owner fled to the south of France, and her descendant kept up the rent payments. Filled with exotic furnishings, it was a time capsule of the of life of a glamorous socialite and actress from the Belle Époque named Marthe de Florian. 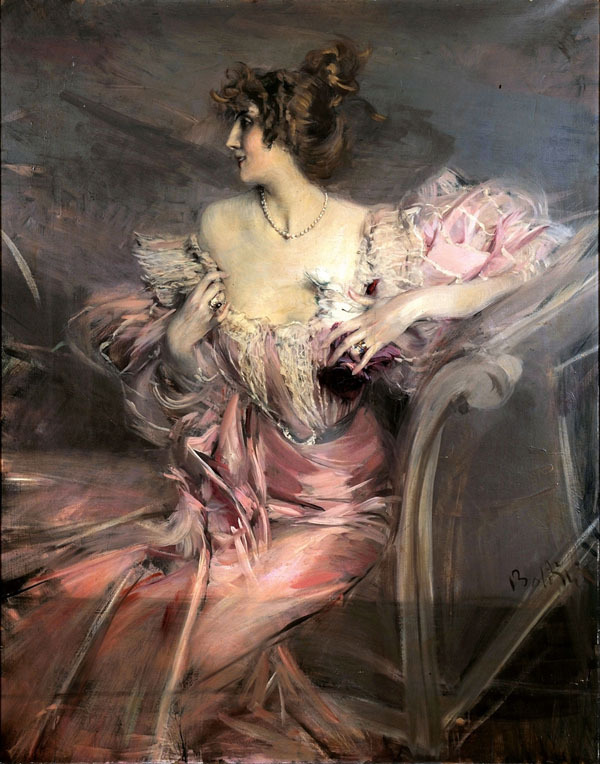 Among the treasures in the apartment was an unknown portrait of the actress by one of her lovers, Giovanni Boldini, accompanied by a love note and a visiting card from the artist. When the painting went to auction it fetched three million Euros, a record for the artist. Public statues and monuments have been in the news lately for political reasons, but we haven't seen them as much from the artists' perspective. 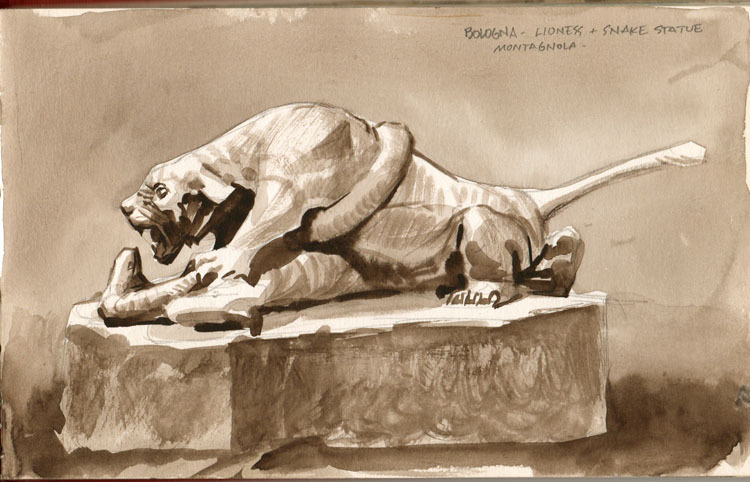 So I invite you to paint or draw a statue near you. "The 1898 monuments are the work of noted sculptor John Massey Rhind (1860-1936) and were produced by the Gorham Manufacturing Company in New York. The statues were originally located [in the] Exchange Court building in Manhattan. When that building was being remodeled in the late 1940s, the sculptures, unbelievably, wound up in a junkyard as scrap. Fortunately, after seeing a newspaper article about the building remodeling, Emily Crane Chadbourne, president of Kingston’s Senate House Association, tracked down the junkyard and sought to rescue the statues. She purchased and donated the statues to the city of Kingston." link for source. 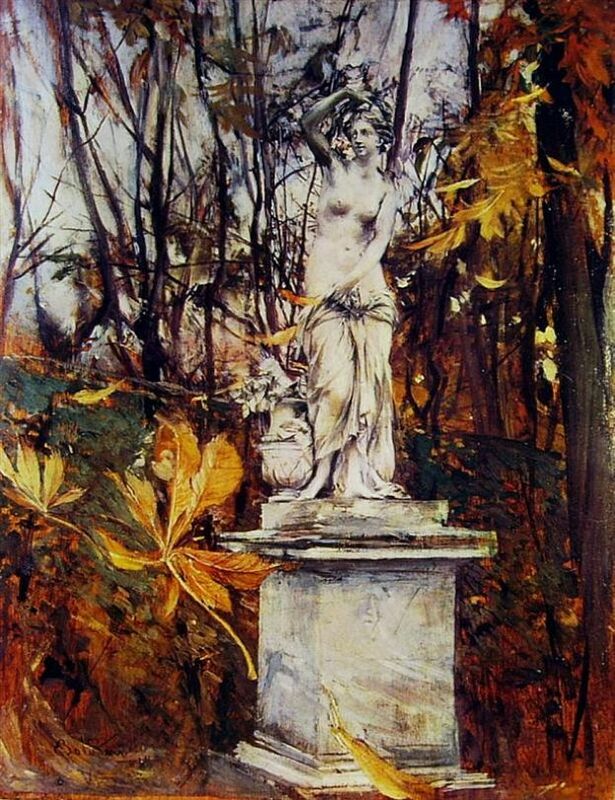 You can paint the statue by itself or in its surroundings. You can paint it objectively or infuse it with your emotional reaction. And you can use any medium, including sculpture. If a statue in your area has been removed and all you have is an empty plinth, you can invent a sculpture of your own imagination to replace it. You can be whimsical or serious with this one, but try to be convincing in how you render it. There will be an alternate "Plinth Prize" for this category. For inspiration, check out the "Fourth Plinth" tradition London's Trafalgar Square. My hope that we can really look at these statues in public places, and appreciate the pure artistry and craft that goes into them, apart from—or perhaps in addition to—their symbolic or historical connotations. • It's free to enter and anyone can enter. • Subject can be any statue or monument presented in a public place. It can be in bronze or marble, free-standing or bas relief, outdoors or indoors. • All drawing and painting media are acceptable: casein, gouache, acryla-gouache, oil, acrylic, watercolor pencils, watercolor, pencil, or charcoal. If you wish to sculpt a 3D maquette in clay, Sculpey, or wax, that's also acceptable. • No limitation on palette colors. You can paint in black and white, a limited palette, or full color. 2. A photo of the work on the easel in front of the subject. Your face doesn't have to be in the photo unless you want to. 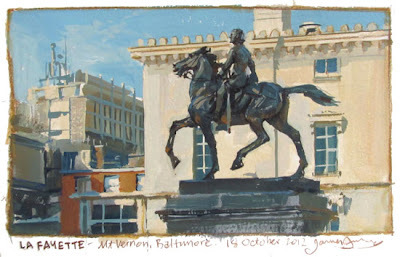 • Please include in the FB post a sentence or two about your inspiration or design strategy, or some information about your experience sketching the statue, about the artist who created it, or about the subject of the monument. • You can enter anytime between now and the deadline, Friday, November 3 at midnight New York time. If you do more than one painting, upload only your best and delete any previous entries. • I'll pick one Grand Prize, five Finalists, and one Plinth Prize winner. 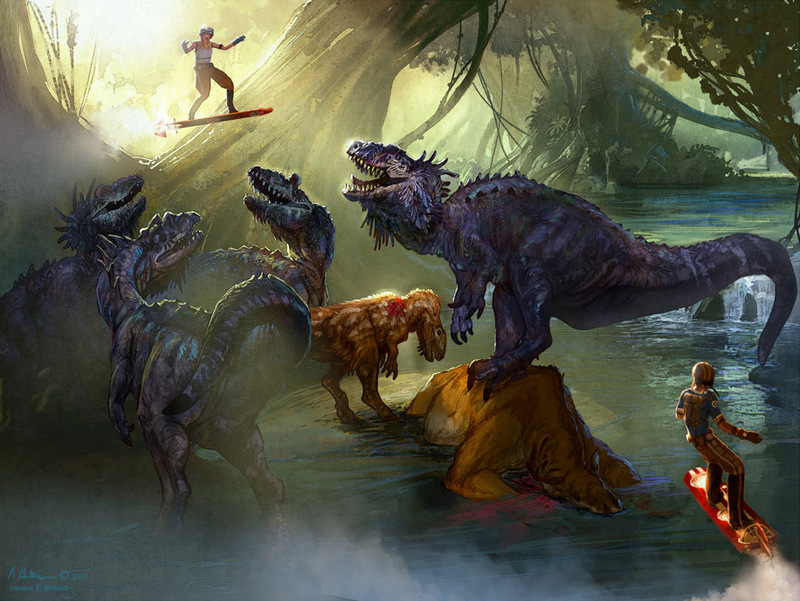 The winners will be published on the blog GurneyJourney. All the winners will receive an exclusive "Department of Art" embroidered patch. In addition, all the prize winners will receive one of my videos (DVD or download) of their choice. • Winners will be presented on the blog on Monday, November 6. The Making of a Bronze Statue, (highly recommended) a 1922 silent film by the Metropolitan Museum that shows the arduous process. Thanks, Studio Maywyn for the idea. 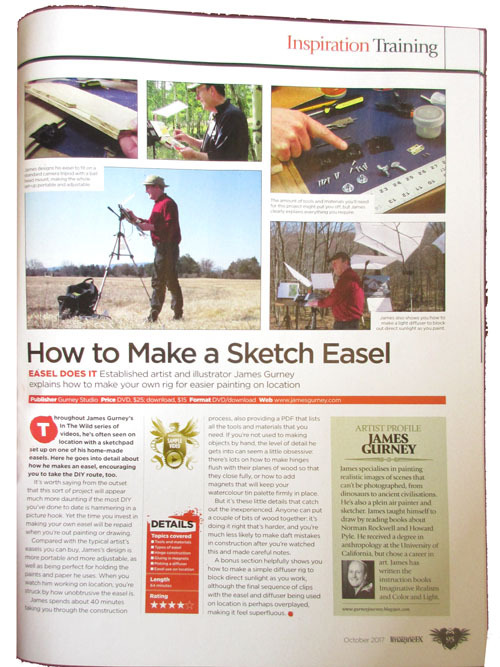 "Compared with the typical artist's easel you can buy, James's design is more portable and more adjustable, as well as being perfect for holding the paints and paper he uses. When you watch him working on location, you're struck by how unobtrusive the easel is." If you want to make your own, you can get a copy of "How to Make a Sketch Easel". The 1080p HD download is available for just $14.95 from Gumroad. The DVD version is available for $24.50, and it includes a slide show. The DVD is also available on Amazon or direct from the manufacturer at Kunaki. 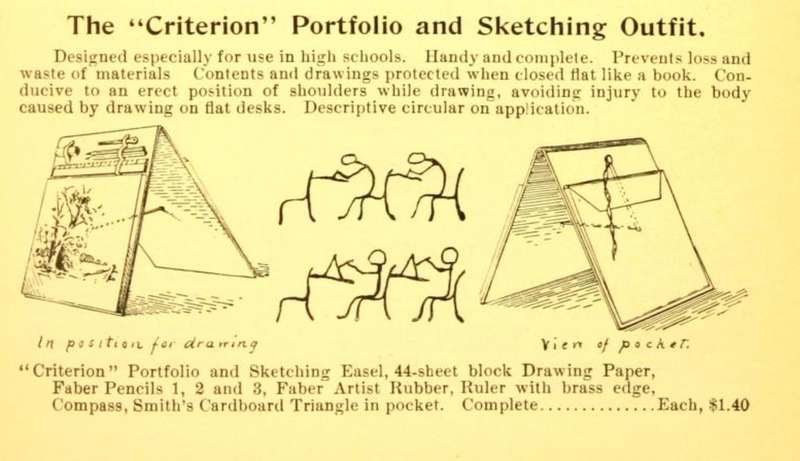 From an antique art supply catalog, here's a design for a simple tabletop easel. The point is to lift the work to an angle that is perpendicular to your line of sight, and to avoid the habit of leaning uncomfortably over the table. It's made of two wood or stiff cardboard panels hinged along the top (you could glue a canvas hinge or use metal hinges), with a string holding them apart at a fixed angle. The drawing pad could be clamped to the front panel, and on the back is a manila envelope or expanding wallet file for holding loose sheets. 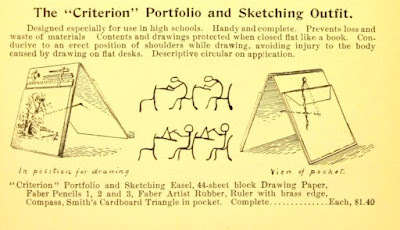 They show the pencils held in with elastic straps at the top, but I would build it with little or no clearance above the pad, so as not to interfere with your line of sight. The whole thing folds flat when not in use. You could also make a smaller version of this to suit a single sketchbook. The string holding it open could be made adjustable by running it through a hole in the back to a cord lock clamp . Most table easels on the market now are more complicated or expensive than they need to be, involving an aluminum structure or a wood box with a tip-up section, or wood panels hinging from the bottom . This graph shows Google search volume for coloring books (red), plein air (blue), art supplies (yellow) and easel (green). The blue peaks are in July, and the green and red peaks are in December. • Interest in "coloring books" (red line) peaked at the end of 2015. Bookstores have reported a steep drop in sales of coloring books for adults, but even in their reduced number, they're still strong sellers on Amazon in the "drawing" category. 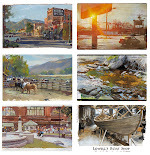 • Interest in "plein air" is seasonal, peaking in July. If you're releasing a plein-air painting product, summer is the best time. • People research easels and art supplies in December, probably to be given as gifts. 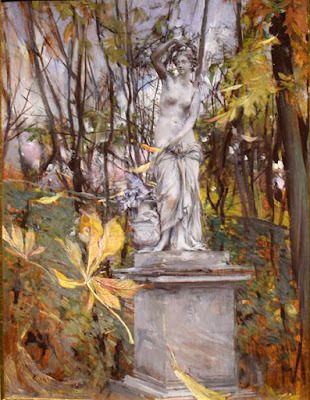 A statue of a goddess stands in a wild section of the park at Versailles. Autumn leaves cascade down around her. A clump of yellow chestnut leaves passes near us. 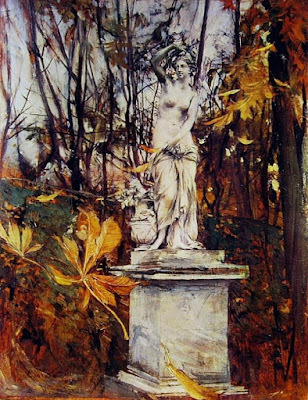 This painting by Giovanni Boldini (Italian, 1842-1931) emphasizes the contrast between artifice and wildness, between the constraints of the human world and the wildness of nature. It also suggests the transience of the seasons versus the permanence of stone. The painting was probably done from observation on location, but I would guess that the image lived in his imagination first. Last night an art museum in Connecticut played host to "trolls, nymphs, and mermaids, plus cosmic warriors on alien planets." 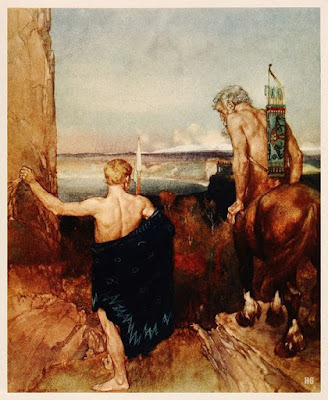 The Stamford Art Museum and Nature Center opened their exhibition called "Illustrations of Imaginative Literature: Masterpieces of American and European Science Fiction," with original artwork borrowed from the Korshak Collection. 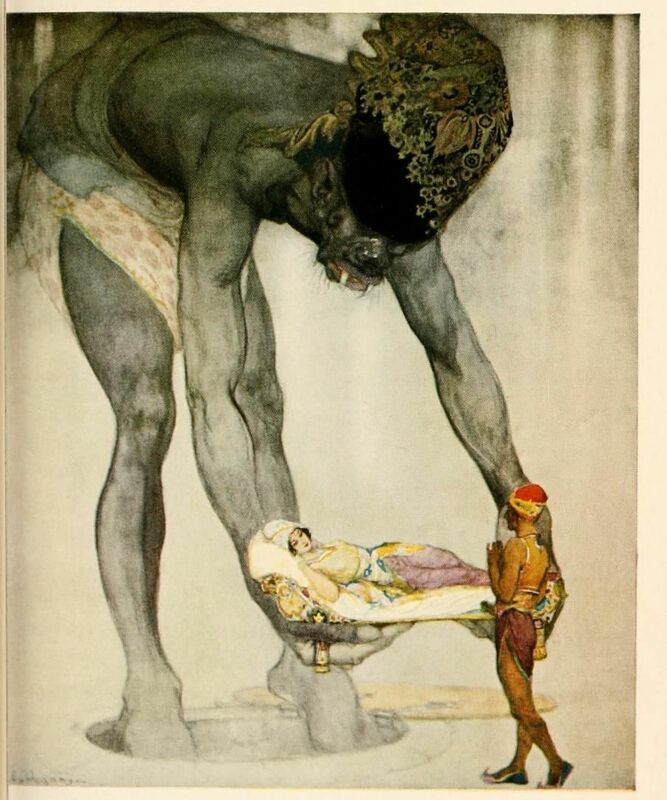 The show includes some of the best examples by Arthur Rackham, Frank Frazetta, Jose Segrelles, Willy Pogany, Sir William Russell Flint, Gustav Tenggren, Edmund Dulac, Roy Krenkel, William Heath Robinson, Fortunino Matania, Brian Froud, Heinrich Kley, and Frank R. Paul. 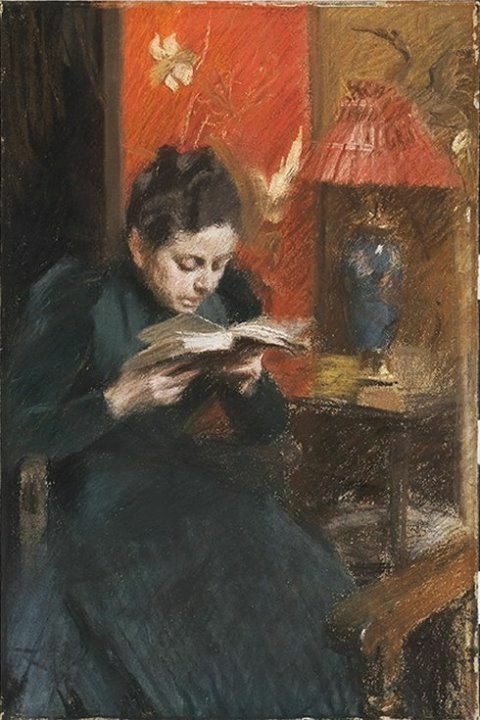 The exhibition was composed of approximately 90 works, divided into two main rooms, one showing the European tradition (which was composed mainly of delicate pen and ink drawings and watercolors), and the American tradition (which tended to be brighter in chroma and more exuberant). 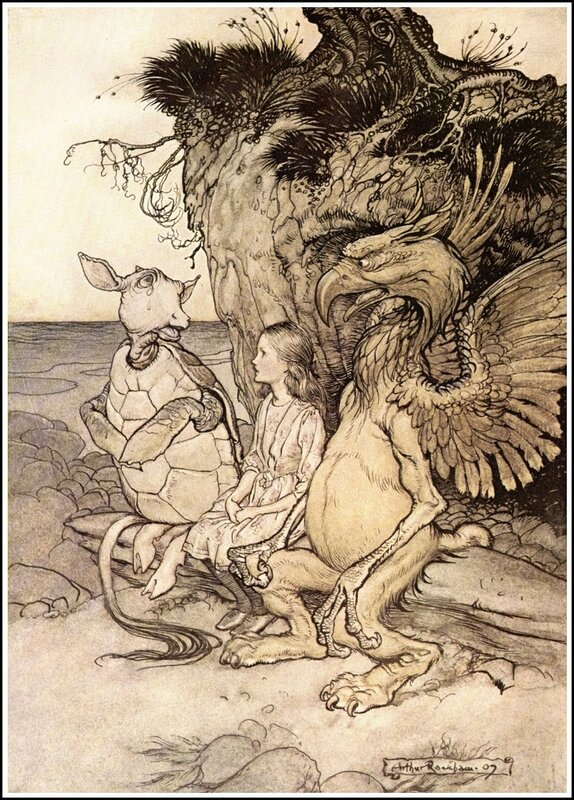 Displays of books and magazines in the cases gave context to the original art, and tied the images to the joys of youthful dreaming about faraway worlds. The opening was packed with people of all ages and backgrounds. There were even some kids looking up from their glowing devices. 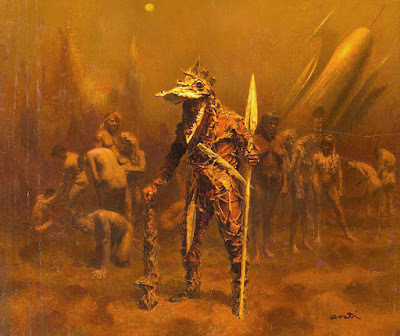 "In the last twenty years we've seen science fiction come out of the shadows," said Michael Whelan , a noted paperback cover illustrator throughout the 1980s, as he toured guests through the galleries. "Now it's become part of the mainstream." He remarked about the ease with which contemporary illustrators can submit their work to publishers via email, but "now we're competing with artists all over the world." Illustrations of Imaginative Literature: Masterpieces of American and European Science Fiction from the Korshak Collection will be on exhibit at the Stamford Museum, Stamford, CT through October 29, 2017. Novem­ber 20, 2017 - February 4, 2018. Next month, two author/illustrators will be releasing visual novels set in imaginary worlds of their own creation. 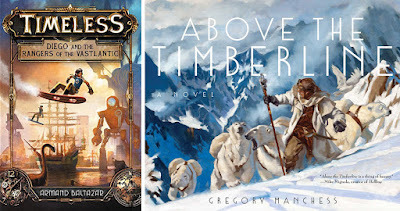 Armand Baltazar, formerly of Pixar, produced Timeless: Diego and the Rangers of the Vastlantic , and illustrator Gregory Manchess invented Above the Timberline . They both agreed to be interviewed, and I thought it would be fun to ask each of them the same series of questions by email. Neither of them knew what the other guy said. 1. Please give us the one-sentence pitch of your story. 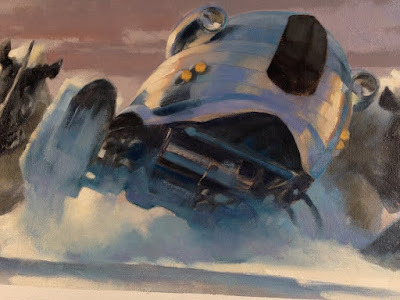 Manchess: On a future frozen Earth, an obsessed explorer goes missing on an expedition to a lost city under the ice, his only chance for rescue is a young inexperienced pilot…his son. Baltazar: Timeless follows the adventure of a thirteen year old boy named Diego and his friends as they travel across the world fantastically changed by the fragmenting of time in order to rescue his father from a 2nd century Roman general and a scientist from the future who plot to reshape the world to their liking. 2. How many illustrations will there be, and what is the balance between text and visuals? 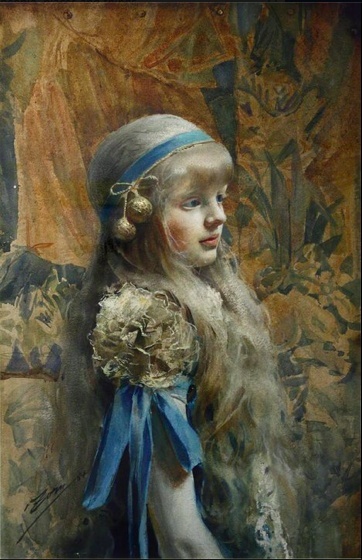 Manchess: Including the book jacket and the case cover, there are 124 major oil paintings. Each turn of the page reveals the progress of the story through a combination of text and images, in varying amounts. 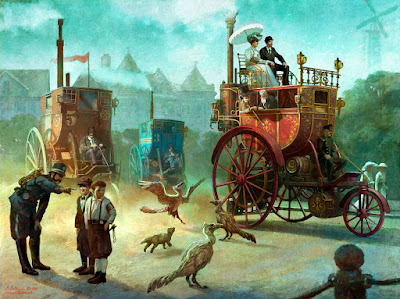 Baltazar: Timeless is a 600 page book with about 440 pages written with about 160 pages of full color illustrations interspersed between the prose totaling around 200 mixed media paintings in varying sizes. It reads like a novel using traditional spreads and spot illustrations blended with graphic novel style sequential panel storytelling. 3. 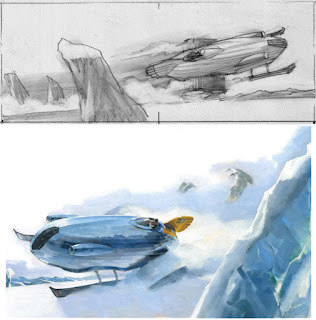 How did you plan the book—for example, did you do written outlines, pencil storyboards, color scripts, value thumbnails, or compositional line drawings? 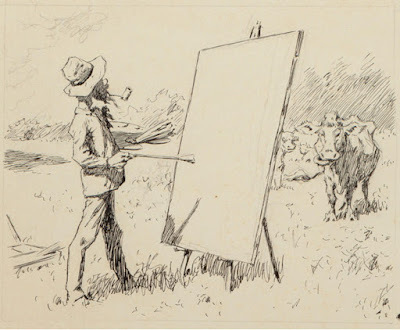 Manchess: I started with some simple notes, then began with very small, rectangular thumbnail sketches, designed for strong compositions, to get a feel for the rhythm. These led to writing, which led me to sketching again. Back and forth, until it was established. Then years of tweaking! It took seven years to get it in book form. Baltazar: For the writing I alternated between traditional novel writing using outlines and revising drafts with elements of screenwriting and graphic novel layout. Visually I approached the chapters like a film script and would often thumbnail, then storyboard sequences, and build lighting and color scripting into those panels. I used a combination of thumbnailing, CG set model building, and drawing in line and in digital paint as part of my design and painting process. 4. How much did you have completed before you sold the idea to the publisher? Manchess: While patiently waiting to get it sold, I’d already finished several drafts of the manuscript and had it completely laid out, page by page. Baltazar: I had about 12 to 15 full color illustrations and drawings completed and one complete "very" rough draft of the story. The first five chapters of that draft were more refined and what I initially shared with potential publishers. 5. Did the making of the visuals cause you to rethink the story? Manchess: Absolutely! The writing spurred visual ideas, and those initiated more scenes of writing and dialog. I played it over and over in my mind and got new ideas after many run-throughs. Then I’d start again to make the storyline cleaner and more interesting. Constant development. Baltazar: Yes, but more specifically... how I wrote the story. We (with the editor) made the decision to use illustration to both bring the text to life visually and to replace sections of written text to tell the story. In those places the imagery would drive the storytelling, so in the written manuscript [there] were entire segments left unwritten to be completed with visuals. 6. Is this a project you could do in your spare time, or did you have to clear off your other commitments? 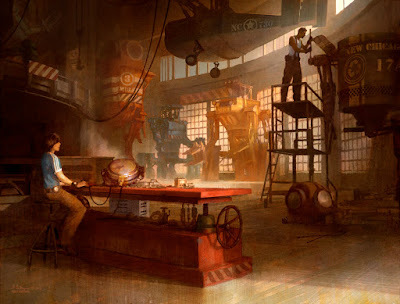 Manchess: I kept a busy schedule while writing, through several major projects, and taught every week online. Even through a couple of gallery shows. I couldn’t wait to get through an assignment so I could work on the book in the evenings, early mornings, whenever I got a chance. I was possessed. Once it sold, I spent eleven months painting all the images straight through. Baltazar: It started off in my spare time but as I became more serious and invested in the project, I realized I needed more time to focus so after completing my work on Pixar's Inside Out, I made the decision to take a break from animation and work on it full time. Afterwards I was fortunate when HarperCollins read my story and wanted to publish it and later when Twentieth Century Fox approached me to develop it for a film. 7. Did you get enough of an advance from the publisher to cover your work time, or did you have to cultivate other sources of income? 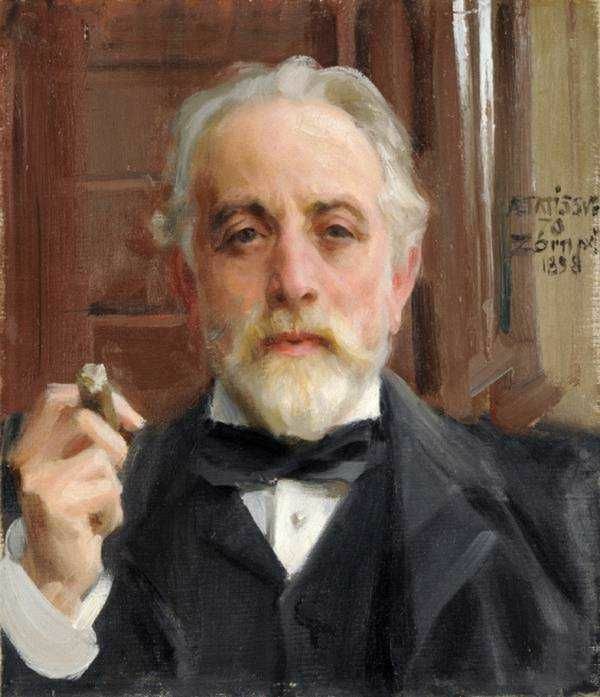 Manchess: The publisher gave me an advance, but I also had to supplement my income with other work. I was in a unique position to complete this novel, almost as if I’d been training for it my entire career. I’d written many finished projects before working on Timberline, and of course, I’d been training to hit deadlines for several decades. So I was able to manipulate my time between commissions and building the novel. 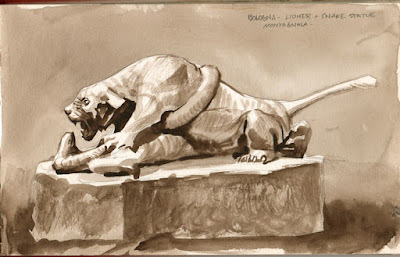 Baltazar: After I left Pixar to work on the book I took on freelance to pay the bills. After my story was picked up, it was the combination of both the publisher advance, and the movie studio option that enabled me to work full time . 8. What kind of editorial input or guidance did you get? Did you meet any resistance or skepticism about being an artist-turned-writer? Manchess: Initially, publishers were skeptical about whether it would sell, or even if I could get it done. I admit, I wasn’t always confident I could do it! But once it was sold, and I started, Saga Press was very hands-off. 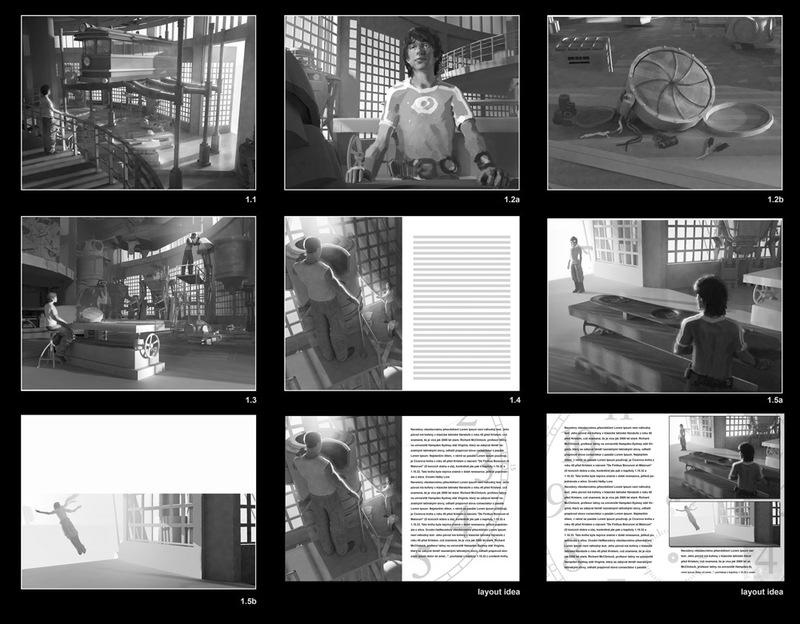 I built the entire book from the ground up visually, with minor coaching on writing from my editor, Joe Monti. He was brilliant, and helped keep the story from getting too cumbersome. Baltazar: I have a great agent who was an accomplished YA writer that gave me great guidance in finessing my story for a middle grade audience in terms of length, tone, and craft. I met with rejections, skepticism, and bias, but I understand that rejection is part of the journey and in the end it was about working hard to improve as a writer and ultimately find the kind of publisher that was right for my story. 9. Did you work on several paintings at once, or did you approach them sequentially? Why? 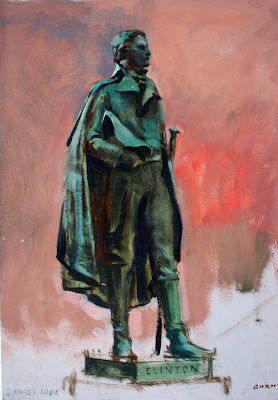 Manchess: I approached it like a film: between the beginning and the middle. This helped disguise my learning curve, allowing me time to get in a rhythm of painting which will keep the viewer from detecting my confidence levels. I got better as I got deeper into it, naturally, working back and forth. I had multiple paintings going at once, sometimes 25 to 30 pieces in progress, all pinned to the walls! 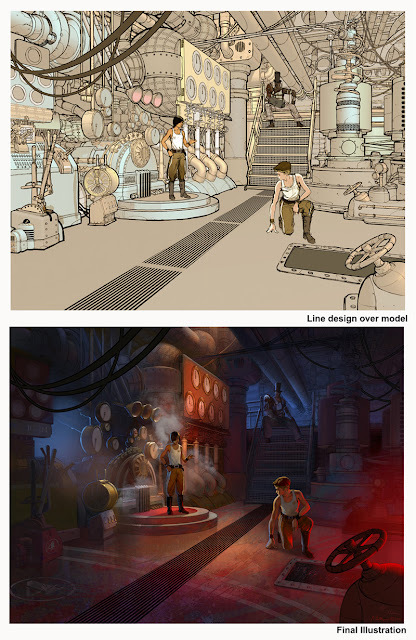 Baltazar: Designing and illustrating for animated film is sequential storytelling that requires all aspects of the visuals to be in lockstep like instruments in an orchestra performing a symphony. That discipline had a direct influence on my method and workflow for the book. I approached the chapters as sequences within acts of the story and I would compose, design, light, and paint illustrations that would define the arcs of the character and story. 10. What did you learn about your own productivity and time management, or your own psychological or physical limits? 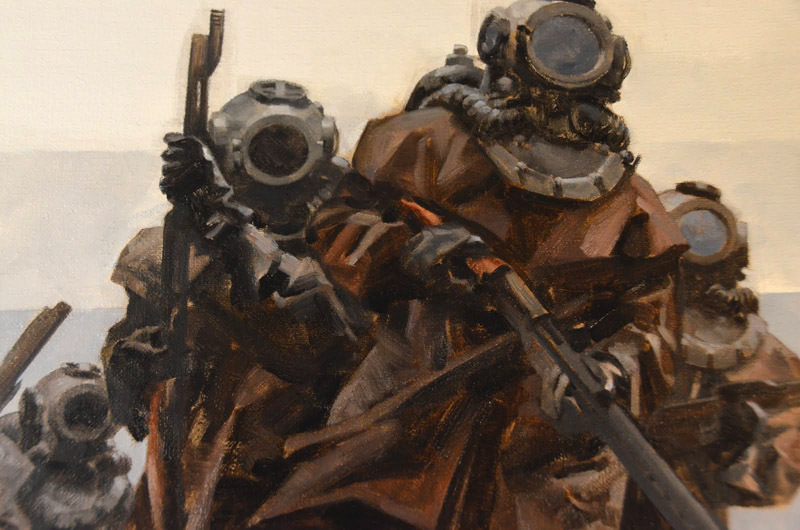 Manchess: I learned a boat-load about how I work, and how I could set myself up to work in "The Zone." I worked with a general schedule: up, showered, breakfast by 9am, reference gathering and sketching until about 1pm, paint until 6pm, break for hot chocolate, dinner, paint until 11 or 12am, watch a film or read, sleep. Not everyday was exactly the same, depending on the specific image I was attempting. Baltazar: Managing time, productivity, stress, and health and wellbeing was one of the most difficult aspects. Writing and illustrating a dense epic adventure is daunting enough but learning to manage how to work, live, and have a healthy life with your family and friends required the same Herculean effort! I came out stronger and hopefully... wiser on the other end. 11. Were you thinking about the potential of this project as a movie as you developed the book? Did you actively court movie producers with that idea as it was in development? Were the movie rights included in the book deal, or did you reserve them? Manchess: My literary agent got us in touch with a film agent right away because of the strong cinematic visuals associated with the story. I was discussing film locations before I’d even painted a stroke! Crazy. But Hollywood is rather fickle. First and foremost, my mind was focused on making the book work as a novel. I did reserve the film rights, as the publisher wasn’t interested in them. Baltazar: I fantasized that someday it would be great if my story became a movie , but in truth that was the furthest thing from my mind as I worked on it. Early on I was approached by producers but refrained, wanting to secure Timeless as a book first before entertaining any opportunities. In the end I reserved the movie rights separately from the publisher. 12. How is the nature of the illustrated book as an art form different from a movie? Manchess: The book is definitely not a film on paper. I can control time far better in this format than a linear film can. I can jump back and forth, as long as it’s clear for the reader, they’ll stay with it. Our thoughts work like that anyway. We are back and forth, past and present, future and past. Our thoughts are rarely linear. Film is restricted, but the culture is learning to push out of that restriction. Baltazar: The illustrated book is very different as it is your vision that drives the art and story of the book. A movie is a collaborative art form whereas the end result is the product of the director, producers, writers, artists, musicians, craftsmen, technicians, and support working collaboratively on a (sometimes) massive scale to create the cinematic story. 13. Are you comfortable with your book being classified as young-adult or placed in the kid’s section of the bookstore, or will it be presented as adult science fiction? Manchess: I had started with an older protagonist, but it was suggested that the YA market might open it up to a wider audience. I think the book will appeal to adults, because it’s written from an adult perspective, but one that young adults can easily access, and will appreciate the approach. 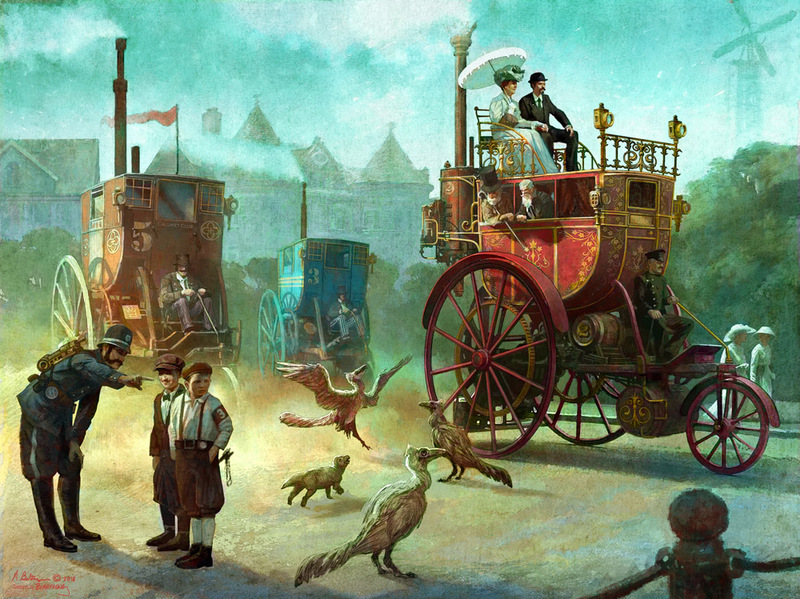 Baltazar: I feel very good with Timeless book 1 as a Middle Grade children's book geared towards 9–13yr olds and up. It follows a path similar to the Potter series as Diego and his friends begin the series as young teens and end as young adults. The maturity in the themes, writing style, and tone will evolve with the characters with the last few books in the completed series transitioning to YA. 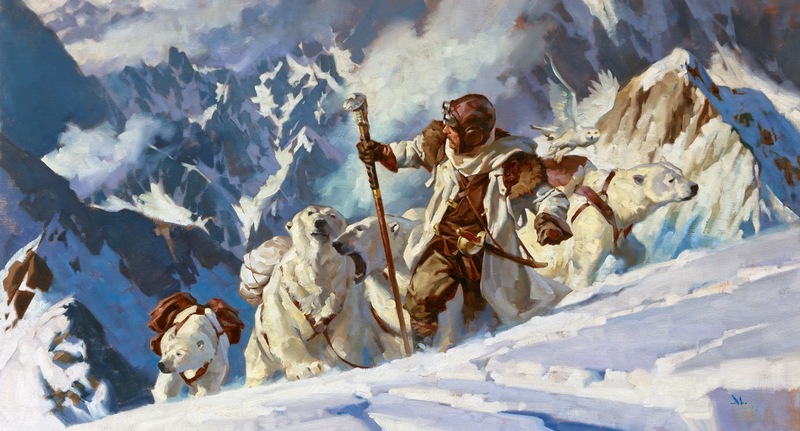 Greg Manchess documented the making of the first painting long before he envisioned the book. 14. How will you and your publisher be marketing and promoting the book? In an ideal world, if budgets and time were no obstacle, how would you want to see your book marketed? 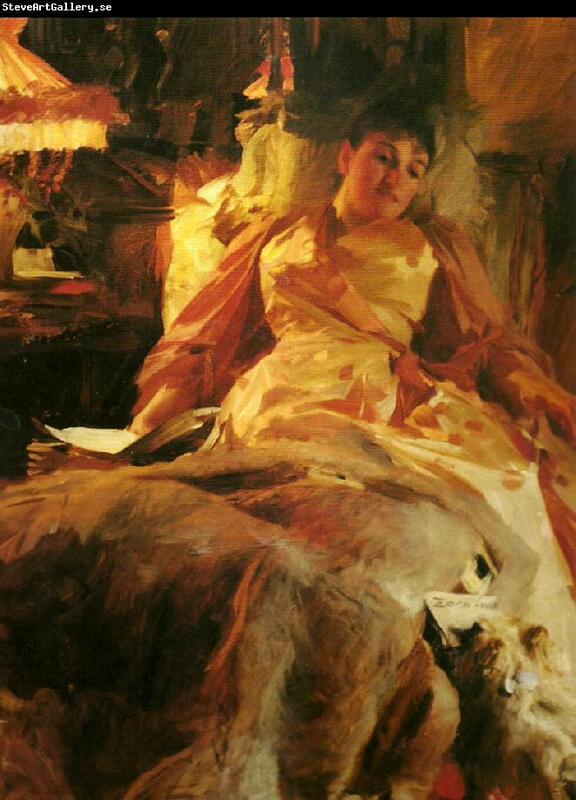 Manchess: Publishing, like the art world, is incredibly hard, if not impossible, to gauge what works and what doesn’t. Saga Press has been very supportive about this novel, but still the best promotion any book can receive is word-of-mouth; to have readers and fans talk about it. Honest appraisals. In an ideal world, I’d want every reviewer, librarian, and bookstore talking about it. I’ll be working hard to promote the book, and with that I’ve produced a few video book previews to get readers excited. And they’re fun! Baltazar: We will be marketing the book in all the traditional ways with video interviews, school and store visits, book fairs, and conventions. If the sky was the limit...I'd love to have a traveling art show with models, maquettes, costumes and props we made on exhibition at all the schools, stores, and venues we are promoting the book and maybe a cool animated book trailer for later books!